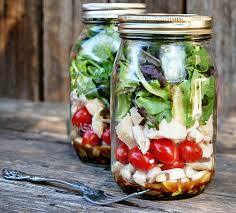 Spring Health & Beauty Tip 26 – Salad in a Jar! Easy, healthy lunch on the move! If you are taking lunch somewhere, I think one of the most of putting things about salad is that it either required a big box, or you have to take all the bits with you to keep it fresh, the lettuce goes soggy in the dressing etc, etc…. Well not anymore! Since hearing about this idea I’ve become a little bit obsessed by it, partly because they just look so pretty and I love a jar! Finally, fill the rest of your jar with lovely leafy greens. You can add meat, fish, hard boiled egg cheese etc… but just be aware that you would only want to add those on the day you are eating the salad. But otherwise, salads can be made a few days in advance so you can do a few at a time and grab one in the morning as you rush out the door. Do you have any delicious salad receipts? Let me know in the comments box.